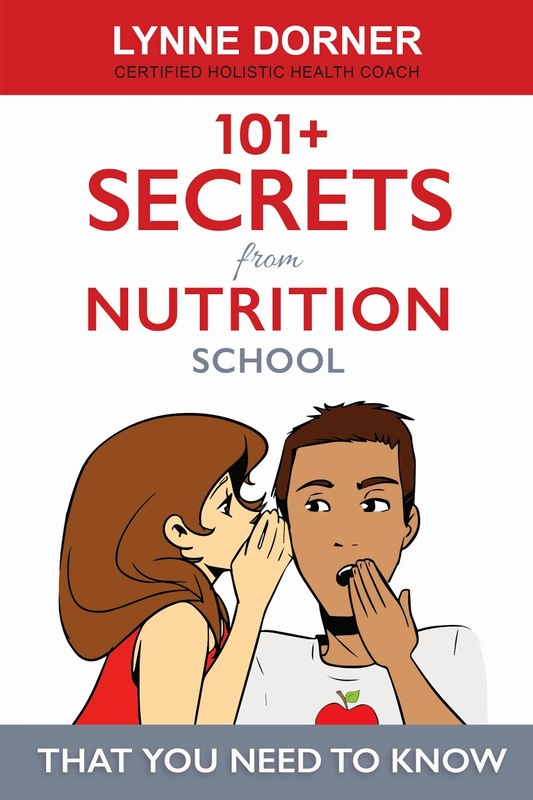 Today we are interviewing Lynne Dorner, author of 101+ Secrets from Nutrition School | That You Need to Know. I would consider myself a super active mom who manages to wear many different hats. Each hat is super important to me. I love to wake up and dance around my kitchen making breakfast and lunches. (I don’t love the put your shoes on game as the bus is pulling up.) I find the quiet time after the bus pulls away to be magical. I am usually excited to start my day. Sometimes I sing in the shower, create a new recipe or dash out the door to meet an early client. I am so blessed to have not only one but two careers that I love. I am an electrologist who went back to school to further my nutrition education. Surprisingly this led me to become a integrative health coach. I have somehow worked out my schedule so that I can be highly active in both careers and be a very involved mother. My days are organized chaos. I can go from seeing clients, to working on a healthy cooking project to spending time to work on my writing projects. Then it is on to play dates, gymnastics and homework with my son. I also make it a priority to spend quality time with my friends, family and church family. Everyday isn’t perfect but I love the life that I have built. My life reflects my values of serving others and making my choices based on what would make us healthier and happier. My book explores the most important and up-to-date areas in health, nutrition and lifestyle choices that I studied in school. I transformed these controversial and extensive topics into simple, manageable options for the readers to experience, enjoy and hopefully explore and practice. Who do you think would benefit most from reading your book? While I was writing the book I envisioned it sitting in waiting rooms at doctors' offices, spas and healthy restaurants. I was hoping that people would pick up fun, inspiring, healthy tips instead of reading boring/scary drug ads. I wrote so that I could speak directly to them in a chatty, witty way instead of using confusing medical jargon. One of my clients recently told me that her 4th grader picks up the book after school and talks about it with her. She said that they are very invested in learning together as a family. How exciting is that? My goal is to reach people in that “place” so that they wake up, have an ah ha moment and start a better way of life! When did you first become interested in health and nutrition? I would say I have been obsessed with cooking and trying fad diets every since high school. Once I opened my electrolysis practice in 2002, I started to link the patterns of my clients and their Health Histories. Many are overweight, have allergies, thyroid issues, PCOS, anxiety and overall hormonal issues. I really enjoy talking with them about the different strategies that they have tried with and without the support of their doctors. My urge to go deeper came on suddenly when my son was born premature. I was fortunate that a close “mom” friend, who was super knowledgeable about nutrition, was able to give me some hands on learning. As I explain in my book, the stars sort of aligned all at the right time a few years ago. I can say that going back to study at Integrative Nutrition has proven to be the most dramatic transformative tool for myself and most of my classmates. What inspired you to write a book about what you learned in nutrition school? A friend of mine wrote a book about chef school: 101 Things I Learned in Culinary School. I just loved it. So I had that in the back of my mind when I was going through school. I took exceptional notes so that I could eventually share all this information in my future book. While listening to my lectures I kept thinking: I wish I could tell my mom about this, or Joe about that, or my client Jackie about this. When my school announced the “Launch your Dream Book Class” I jumped on the opportunity. You bring up the importance of recognizing “bio-individuality” in your book. Can you talk a bit about this concept and why it is important? Everyone is different. Where we live, our ages, climate, health issues and lifestyles. It would be silly to think that we all would benefit from the same nutrition choices. Last night, I took a Thyroid Class with Andrea Beaman at Natural Gourmet Institute and she summed it up so nicely. She said that she heard that Michael Phelps eats so much sugar all day long starting his day with Fruity Pebbles and Captain Crunch. For most of us that much sugar would make us sick because we aren’t swimming thousands of laps everyday. We wouldn’t be able to burn it all off. We would crash and burn. Michael Phelps is also blessed with good genetic make-up, age, height and location. We are not all like Michael Phelps. Something a lot of readers are saying is that the advice in your book is very practical. How did you take complex information about the body and nutrition and make it practical for the average reader? Personally, I love humor. I learn best when information is plain and simple. I also love when people get right to the point. Twitter is great for this type of writing. I really wanted the readers to be able to absorb these secrets the way I would talk to them in my office or on the phone. I try to break things down so they aren’t too complicated and entice my clients to want to try things on their own. I also share my own experiences or try to make meaningful examples that are easy to absorb. Getting to your point- I just wrote and wrote until it was short, memorable and how I liked it. Otherwise, I chopped it from the book! I think I started with over 280 Secret topics! I can honestly say that I am blown away by the impact it has already made on people. The emails, letters, texts and facebook messages I have received have been so heart felt. People “want” to read the secrets, share the secrets and try the secrets. The results have been so amazing. People are losing weight, trying new foods, getting UNCONFUSED and excited about nutrition. People are finding hope with their illnesses and loving themselves more. I can honestly say that it was so worth it. People I never imagined are reading the book and making a connection to “something” and wanting to go deeper. It also impacted me. I had to miss my grandfather’s funeral in 2012. It was devastating to me. Since I dedicated the book to him I feel that a huge part of me felt his acceptance and love surrounding that unfortunate loss. In addition, I had the powerful experience of doing some last minute editing with my mother. I wrote the Forgiveness Secret while I was on the phone with her while tears were streaming down my face. It was an experience I will cherish forever. My hope is that the readers will be inspired to make improvements in their health and life-styles by reading my guidebook. . Even if people had heard of a tip or fact before, hopefully the way that I presented the material will be meaningful, memorable and motivational! Currently, I am working on 2 projects. I am working on a Clean Eating Guide with my team. I am also working on finishing a novel I started 7 years ago! It is fictional novel that I wrote while I was struggling through my divorce process. Shhh I don’t want to give away too much but it is so juicy! If you are wanting to make a change, get healthier and explore being happier, I want you to know that it is all possible. No matter what you are going through, the support you need is out there. I have successfully worked with people who are battling cancer, dealing with agoraphobia, anxiety, broken marriages and transitioning out of stressful jobs. They were able to make a change and so can you. Pick up my book, join our clean eating programs, sign up to go back to school, make a new friend, join a club, dance where you are, smile….you are worth it!